Under a proposed ballot measure, passengers would pay a per-pickup charge through ride-hailing apps like Uber and Lyft. The funds could pay for transportation improvements or other services. An Uber and Lyft tax could help pay for repaving city streets. Five years ago, the California Public Utilities Commission issued a decision giving itself almost exclusive regulatory authority over transportation network companies like Uber and Lyft. Ever since, local public officials throughout the state have assumed cities' hands are tied when it comes to creating rules governing the burgeoning ride-hailing industry, which is now worth billions. But according to Oakland City Councilmember Rebecca Kaplan, there is one thing that cities have the power to do when it comes to ride-hailing services: tax them. "The power to tax is a separate power regardless of whether or not you can regulate something," said Kaplan in an interview last week. Kaplan is proposing that the city council put a measure on the ballot to impose a tax on all trips taken in Oakland using ride-hailing apps like Uber and Lyft. If approved by voters, the measure's funds could be used to offset negative impacts that ride-hailing services inflict on the local transportation system or pay for infrastructure like roads, she said. "They're using our streets to do business, and we don't currently have any revenue from it," Kaplan said. A per-pickup charge could raise anywhere from several hundred thousand to millions of dollars per year for the city. Other city officials haven't taken a position on whether to tax the ride-hailing industry, but the idea isn't new. 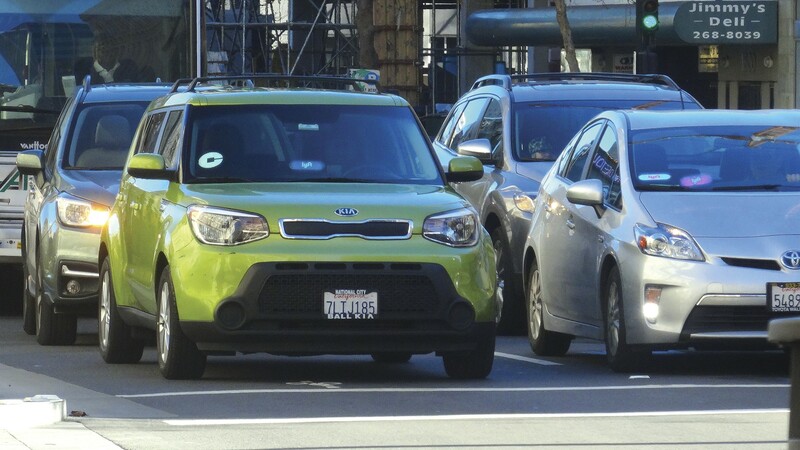 Oakland officials have been discussing possible ways to tax transportation network companies like Uber and Lyft since 2015. However, it's not clear whether cities and counties can legally tax ride-hailing services. Currently, no city in California taxes them, and only airports are explicitly permitted under state rules to impose pickup and drop-off fees. For example, Oakland International Airport charges a $3.70 fee for pickups and drop-offs and doesn't allow drivers to linger inside the airport's property. San Francisco's airport has a $3.80 charge. City of San Francisco officials have also recently been discussing a possible tax, but they've yet to take action. California, in many ways, is behind the curve. Boston collects a 20-cents-per-trip tax that goes into an infrastructure fund. Chicago charges a 40-cents-per-trip tax and an extra 10 cents that goes into a special fund to subsidize wheelchair accessible services. Seattle also has a wheelchair services surcharge and a per-trip fees ranging from 14 to 35 cents. Oakland currently has a $443 million backlog of repaving work that it needs to complete on its streets. And the city's department of transportation is lightly staffed and overwhelmed with transportation planning work and the task of looking after the growing number of privatized transit systems in the city. Any new tax revenues from ride-hailing companies could help pay for these needs. Or, they could be directed in ways that improve public transit services like buses, BART, and more. Hana Creger, who is with the Oakland-based Greenlining Institute and studies transportation and transit policy, said services like Uber and Lyft are "artificially cheap" for riders, because the companies have managed to avoid the regulatory and tax powers of local governments for so long while pushing costs on the independent contractors who serve as their drivers. "There are many hidden consequences," said Creger. "Riders can't necessarily see them when they pay, but Uber undercuts taxis and public transit, and they don't have to pay benefits to their employees, while at the same time they're using public roads for free." One recent survey of 1,100 Uber and Lyft drivers conducted by Stanford University researchers found that the median income for a driver, before taxes, is just $8.55 per hour. But there's some evidence that Uber and Lyft riders, on average, have higher incomes, so a tax on the services likely would fall on a population capable of paying it, and if tax rates were relatively low, it wouldn't necessarily cut into the total number of rides purchased. Clarrissa Cabansagan, who studies urban mobility and inequality at the advocacy group Transform, said a local tax on ride-hailing services is a worthy idea, but that it's important for local policy makers to first determine what problems they're trying to solve with a tax instead of just imposing it to raise money. "Is it that we want this Robin Hood effect of taxing the rich and giving it back in ways that are meaningful for people who rely on public transit systems like AC Transit?" asked Cabansagan. There's also evidence that ride-hailing services are causing congestion in cities, especially in downtowns where many trips originate and end. Meanwhile, ride-hailing companies often do a poor job of providing mobility to lower-income people who live farther away from transit hubs. Many Uber and Lyft drivers also interfere with bus services by blocking bus stops to pick up and drop off customers. And the constant circulation of these cars throughout the urban grid puts more wear and tear on city streets than bikes and buses, while adding to greenhouse-gas emissions. Cabansagan said a tax could be designed as a carrot-and-stick to address these kinds of problems. For example, if rides in downtown areas frequented by affluent riders are taxed at higher rates, the revenue could then pay for transit passes or be spent on subsidies to encourage Uber and Lyft to serve lower-income parts of the city. But she cautioned that some riders in Oakland are lower-income, and ride-hailing companies have been able to fill a service gap unmet by other transit services, such as getting people from residential areas in East and West Oakland to BART stations quickly and comparatively cheaply. Creger said ride-hailing services are biased to serve more affluent riders because they require owning a smartphone and credit card. Studies have also shown that Black people incur longer waits to be picked up — a replay of discrimination that's occurred in the taxi industry. But she said the biggest impact is potentially the decline in ridership on bus services as higher income people choose Uber and Lyft over AC Transit. Solving that problem with a tax could be difficult in Oakland. While the city controls the streets and bus stops, AC Transit is a separate agency with its own sources of revenue. It's unclear how a ride-hailing tax could be used by the city to expand bus services. Lyft officials didn't respond to a request for an interview for this story. An Uber spokesperson would only speak on background and declined to provide any on-the-record comments about Kaplan's proposed tax or more generally about local taxes on their services. But Harry Campbell, a former Uber driver who writes the popular Ride Share Guy blog, worries about the impact of taxes on drivers. "Rideshare drivers feel that they're already making close to minimum wage in many cities after taking into account expenses so additional taxes could hurt their earnings or mean less demand for passengers," wrote Campbell in an email to the Express. But he added that if a local tax were to pay for things that made driving Oakland's streets easier, like new pavement and traffic decongestion measures, drivers might support a tax. But that all depends on whether or not a tax is legal. Kaplan, who has a law degree from Stanford, insists it is, and that she's gotten legal advice to prove it. In San Francisco, Supervisor Aaron Peskin is preparing a similar ballot measure under the same assumption.